Heading to a picnic with friends in far southern Arizona yesterday, we stopped along Sonoita Creek and found an abundant growth of watercress on both sides of the stream. It should be available throughout the West in flowing water. This stand was so lush and abundant, I couldn’t resist picking several big handsful to add to the salad I was contributing to the potluck. Once we got to the picnic site, I cleaned it in fresh water before tossing it with the spinach and peppers I had brought from home. 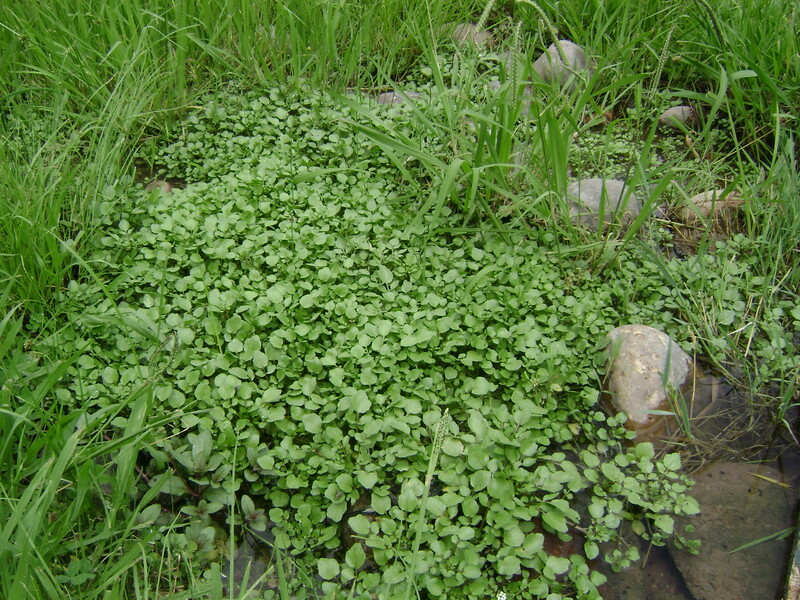 Watercress is easy to recognize with its fleshy stems and small leaves about the size of a woman’s fingernail. And it always grows right in water. Here is a close-up view and shows the variable leaf shapes. When I was researching my first book American Indian Cooking, Recipes from the Southwest (originally titled American Indian Food and Lore) back in 1970, I had hiked down to Supai Canyon with some friends and interviewed some Havasupai women about the edible wild plants they gathered. When I got back to camp and was looking over my notes, I realized that the woman I had spoken to had not mentioned the abundant watercress growing along the creek. I went back the next day and asked her about it.”Oh, that’s food for horses,” was her reply. I told her that white people ate it, even bought it in the grocery story. “Well, we Indians think it is food for horses,” she said, and that was that. Besides adding watercress to a salad, use it to add interest to sandwiches. Or incorporate it into a salad dressing using a blender or a food processor. Find recipes for watercress and other spring greens in Cooking the Wild Southwest: Delicious Recipes for Desert Plants. If you have a favorite place for gathering watercress or an interesting way to use it, please share below. I love your photos. The salad sounded yummy! What type of dressing did you use? Have you thought about taking groups out to look for desert plants? Also, any word on the cholla harvesting? Thank you again for a wonderful post. They make me inspired!